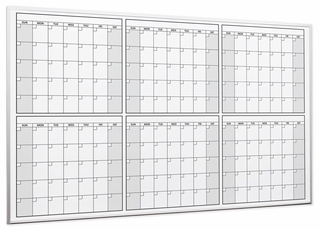 A 6 month dry erase calendar from OptiMA lets you plan a full half year at a time. The calendar displays 6 individual full months. Magnetic six month calendars work great with magnetic accessories like our damp erase magnetic strips are great because you can move around and reuse magnets for recurring events. Of course you could opt for one of our economy 6 month whiteboard calendars if you don't plan on using magnets, and best of all you'll save some money! Either way, magnetic or economy, both are made with our very own Opti-Print™ method so all the graphics are safely under the smooth dry erase surface. From "Size" "406: 4' Tall x 6' W (+$375.00)" "408: 4' Tall x 8' W (+$475.00)"
From "Size" "406: 4' Tall x 6' W (+$299.95)" "408: 4' Tall x 8' W (+$359.95)"